This is a 60 min tour of the St. Louis Cemetery #1 founded in 1789. It's the oldest active cemetery in New Orleans, home to over 100,000 residents within 700 tombs. 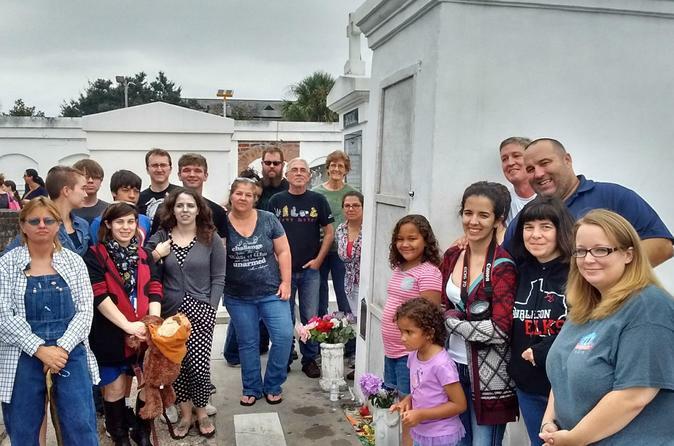 You'll learn about its famous wall oven vaults, family and society tombs, and many of its colorful characters including the most visited tomb of the prominent New Orleans Voodoo Queen, Marie Laveau. You will meet your licensed tour guide and begin your tour at the Three Legged Dog tavern located at 400 Burgundy St in the French Quarter. We will walk two blocks over to the oldest active cemetery in New Orleans and one of the famous cemeteries in the country, St. Louis Cemetery #1. It's one block away from the French Quarter located on 425 Basin St. and it covers one city block up to Treme St. between St. Louis St. and Conti St. And with its many above ground tombs, palatial mausoleums and elaborate monuments, it's appropriately named the "City of the Dead". While visiting you'll learn about the city's most infamous characters in politics, music, military, business and religions in addition to New Orleans' culture, history, and architecture. Be considerate and respectful to this most visited sacred ground while you're here because it is an active cemetery opened to the public and locals visit the tombs of their family members and honor their ancestors. You'll find that the art of dying is also a celebration of life with the spirits of our beautiful Crescent City.